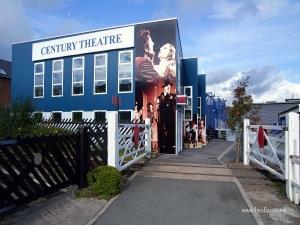 Century Theatre01530 278444work TheatreThis innovative structure provides an auditorium for 206 people and a full size stage, yet can be packed away into four articulated lorry trailers! The theatre was designed by John Ridley who used ingenious design, an aluminium superstructure and hydraulic rams, to create a professional-quality theatre building that could be folded up and moved by road when it used to travel around the country between 1952 and 1974. The Century Theatre. Image used with permission from Mr B. Voller. This innovative structure provides an auditorium for 206 people and a full size stage, yet can be packed away into four articulated lorry trailers! The theatre was designed by John Ridley who used ingenious design, an aluminium superstructure and hydraulic rams, to create a professional-quality theatre building that could be folded up and moved by road when it used to travel around the country between 1952 and 1974. Famous alumni of the Century Theatre include Helen Mirren, Judi Dence, Eileen Derbyshire, Derek Foulds and Tom Courtenay to name a few. Price varies with each performance.